Pyramyd Airsoft Blog: Ripping open the VFC HK416 CQB to get to the guts, which as you know, are required in order to obtain glory. An Airsoft Parable. 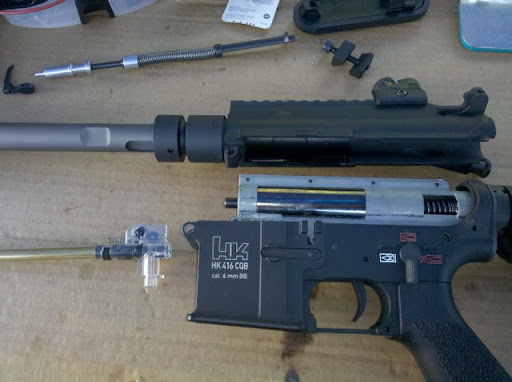 Ripping open the VFC HK416 CQB to get to the guts, which as you know, are required in order to obtain glory. An Airsoft Parable. graciously licensed through Umarex, in stock and available for sale at a very fine establishment I like to call, Pyramyd Air. As I lay here, a broken Airsoft man, I realize I must confess: I'm not actually in a laying position. It's more of a reclined position in a chair. 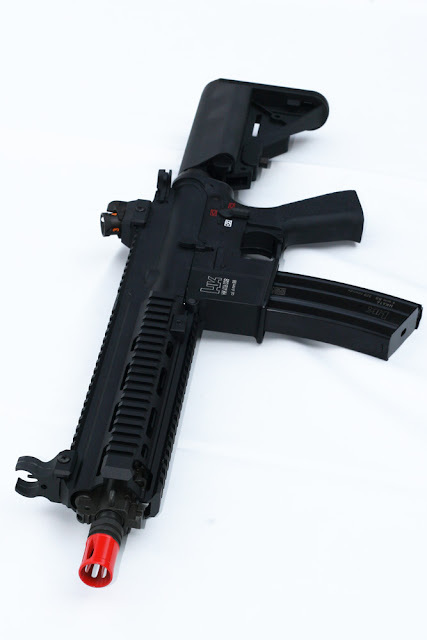 I say, "broken" because that is exactly the status of my beloved VFC HK416 CQB. I foolishly decided that I wasn't satisfied with the generally stellar chrono readings I got during the review. I wanted to see if I could determine the cause of those three large drops in FPS even though the other readings were extremely consistent. So first up, I decided to turn the hop-up on, just a smidge, and chrono it thinking that having it all the way off might have been allowing the BBs to sneak past the rubber bucking and begin rolling down the inner barrel before the gun had actually fired. Don't sound TOO crazy, right? Don't answer that. Just like Tom Cruise, I, too, cannot handle the truth. So, I busted out my wonderfully delicious red, Shooting Chrony Alpha Master Chronograph and put a few rounds past the sensors to see what they'd read. I'll start with the bitter and end on the sweet. I hadn't touched the 416 in several weeks now, probably not since I reviewed it, and probably had left it sitting with the piston locked halfway back or so, leaving the spring in a continuously compressed state for weeks on end. The VFC HK416 CQB, using a .20g Air Venturi BB, clocked in at around a measly 285 FPS. Now for the sweet. It was INSANELY CONSISTENT!!!!! No reading deviated below 280 FPS or above 285 FPS out of around 15 shots or so. I try to live by two very monumental rules, both of which I had to learn the hard way. One, is never wake a sleeping baby. "Why not?" you might ask. Here's a hint, Baby Einstein: The baby will get PISSED!!! And my 2nd rule is to never take apart a fully functional Airsoft gun, like the VFC HK416 CQB in this case. HOWEVER, 285 FPS is nothing short of embarrassing and just plain inadequate. Kinda like Airsoft E.D., so I decided to break my rule, as I often do (I'm not a fan of rules that apply to me). Now I realize that this is an Airsoft CQB weapon and that high-powered, super FPS Airsoft guns are not only unnecessary, but pose a fairly serious safety hazard in environments limited to close engagements only. So I am, by all means, NOT of the opinion that this thing needs to be shooting 480 with a .30g King Arms BB or anything. But it does need a bit of a boost before I will respect it as a person again. Until I can get her shooting between 350 and 400 FPS, the VFC HK416 will NOT be making eye contact with me, or referring to me by first name. So, long story short, this whole ordeal evolved from the desire to determine the cause of some fairly large FPS-drops into pretty much a full tune-up in order to get the 416 back to shooting closer to 400 fps. I've taken the liberty of photographing the general procedures for tearing the gun apart in order to access the gearbox, wherein I proceed to turn a good situation into one that you try to archive deep down in the darkest depths of your mind, only to have the memories resurface during nights of extremely drunken belligerence or sessions of intensive psychological therapy. Here they are (the pictorials, not the unpleasant memories of unfortunate incidences), with some boring narratives. Not having the manual handy (read: I was too lazy and/or stubborn to go into the other room to grab it), I opted to do some exploratory surgery on my maiden voyage inside the VFC HK416 CQB. I decided to start with the strange looking, proprietary bolt on the RIS (rail interface system). I've been very curious to know what it does, so naturally, it had to be removed. And this is what I found: One bolt secures the entire RIS in place, and once said bolt is removed, the rail just slides right off, providing access to the gas tube, which you see in the next photo, here. It wasn't until I had moved on to removing the upper receiver from the lower that I realized that there almost ABSOLUTELY NO NEED to remove the rail unless you're planning on replacing it. However, because of that proprietary bolt setup, it's unlikely that you'll find any of the aftermarket rails out there that will fit this setup. Personally, I think the rail that comes on the gun is "sick wit it." So this step was ultimately pointless. But I will continue to take you through my journey just as it happened. That, unfortunately, requires us to take a few more useless steps. Enter, the removal of the gas tube. Also a highly unnecessary step if you're attempting to access the gearbox. This part does not need to be removed. It's just for looks. However, I appreciate the attention to detail that VFC went through here. Whether or not the real steel HK416 utilizes this same gas tube design is beyond me, but I'd like to imagine for the sake of preserving my high opinion of this Airsoft AEG, that they copied the design to the "T."
To the right, you see the upper separated from the lower and the hop-up chamber & inner barrel assembly extracted from the outer barrel that is still connected to the upper. You'll recall from a minute ago where I said that removing the RIS is pointless. This is why. I was under the impression that I needed to first remove the outer barrel/RIS assembly in order to get the upper separated, but VFC, being the clever girl she is, decided to throw me for a loop. Well played, VFC. Well played. You've won this round. But since I'm apparently a glutton for punishment (why else would I get married? JK, sweetheart. I love you, even when you yell at me for leaving the kitchen cupboard door open regardless of the fact that it poses ZERO risk to anyone or any thing), I'll be returning for more. 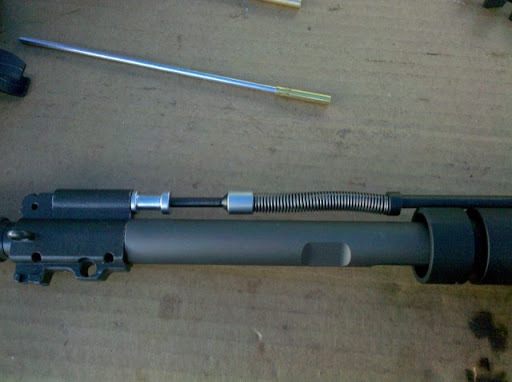 Remove the buffer tube bolt that secures it to the back of the lower receiver. DO IT AND DON'T ASK QUESTIONS!!!!!!! "It's OK, I'm a limo driver!" Name the movie. But seriously, remove the bolt. There's a piece inside that will not allow you to pull the wiring through once you pull the gearbox out of the lower unless you remove the bolt. You'll need a large-blade, flat-head screwdriver with a long shaft *snicker*. Remove the plate on the bottom of the grip so that you can get to the motor. For those of you that are new to ruining your AEGs, a good way to do so is to ignore the polarity of your motor connections. While I've yet to make this mistake (it's only a matter of time, though), you'll want to take notice that the red wire is connected to the positive-side (+) motor connector. 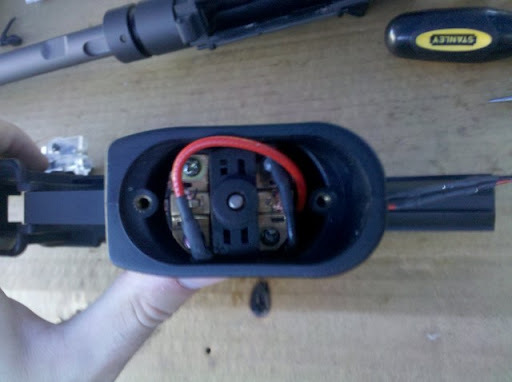 I am not aware of whether this will cause your AEG motor, AEG wiring, AEG battery, AEG itself, or your AEG person any harm, but I can't imagine connecting the wires to the wrong terminals would be a good thing. Do so at your own risk. Also, sorry about that last use of our beloved "AEG" acronym. My impulse control went to Hell in a hand-basket, apparently. 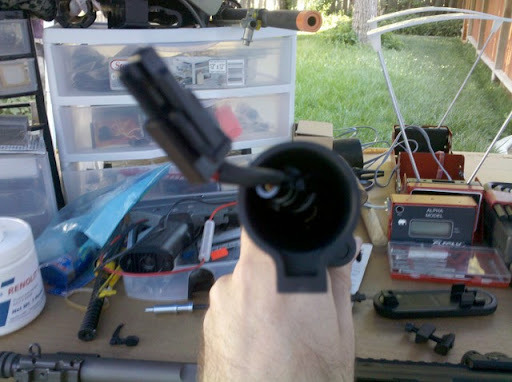 I've yet to see an Airsoft AEG motor that does not clearly indicate indicate which connector is positive with a "+" sign closest to the positive connector. The VFC motor in the HK416 CQB is no different. Some AEG motors have a post that has been marked with a red pen by some of the more thoughtful manufacturers as well. One helpful tip for preserving the connectors attached to the end of each wire is to use a small flat-head screwdriver to slide underneath the connector at the right-angle point and pop it off the motor terminals, rather than just simply grabbing each wire and trying to pull the connectors off. This will bend your right-angle connectors of out shape, requiring you to bend them back into shape in order to properly fit inside the grip. Over time, the bending back and forth of the metal will eventually cause them to snap at the bending point. It is somewhat of a hassle to replace these things because it can be difficult to find the right size at the hardware store, assuming they have them at all. 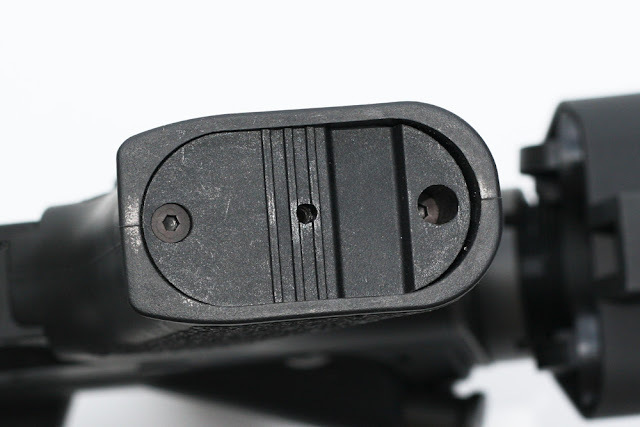 It would also be important to note the orientation that the motor is situated within the grip of the 416. 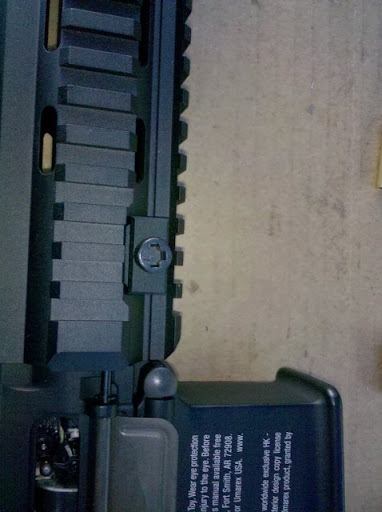 It might be hard to see in the image above, but the motor is situated so that the red/positive terminal is closest to the trigger. You should also notice that once you remove the motor from the grip, the red wire that connects to the motor is longer than the black wire. 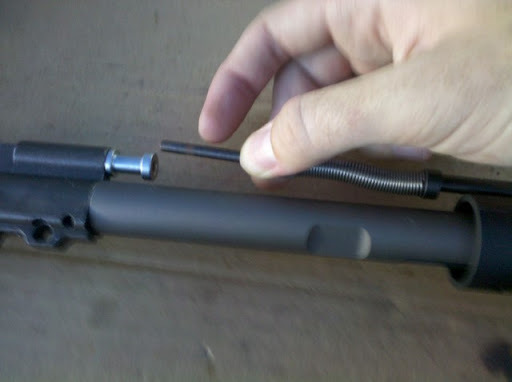 So when you go to put your motor back in the grip and end up with a picture that does NOT resemble the one above, you'll know that you need to pull the motor back out and rotate the body 180 degrees so that the positive side is closer to the trigger side of the grip. Speaking of AEG motors, the VFC HK416 Airsoft AEG motor is apparently red. Red is my favorite color. 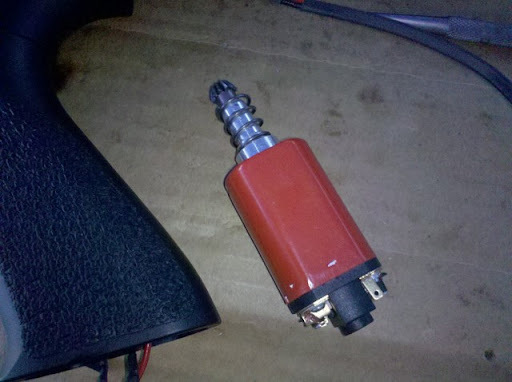 Does this, then, make the HK416's red AEG motor my favorite motor by association with my favorite color? No. Not yet anyway. I haven't had a chance to put this thing through its paces. But I will, and will, of course, update you on my findings. I'm going to make this a stopping point. I've got plenty more to show you on the VFC HK416 CQB, but I've just thrown a borderline, metric ton of information at you in a relatively short period of time. Let this info soak into your core. Reflect on it. Take a few deep breaths in the process. In through your nose, out through the mouth. And for the record, I breath in through my mouth on occasion. If that makes me a "mouth-breather," then so be it. Breathing in through my nose all the time gives me a headache. Too much fresh air straight to the dome. No good. Better to starve the brain. Right, Atkins Dieters?